Other Common Names: Bull thistle, emetic root, frauendistel, fruit de chardon marie, heal thistle, holy thistle, lady’s thistle, Marian thistle, mariendistel, Mary thistle, Mediterranean thistle, mild thistle, milk ipecac, our lady’s thistle, pig leaves, royal thistle, snake milk, sow thistle, St. Mary’s thistle, thisylin, venue thistle, variegated thistle, wild artichoke. Habitat: Silybum marianum is native to a narrow area of the Mediterranean, but has been naturalized throughout Europe and along the chaparral coastal area of California in the United States. Its preferred habitat is a dry, sunny area. Plant Description: The name milk thistle refers to white streaks along the leaf veins. 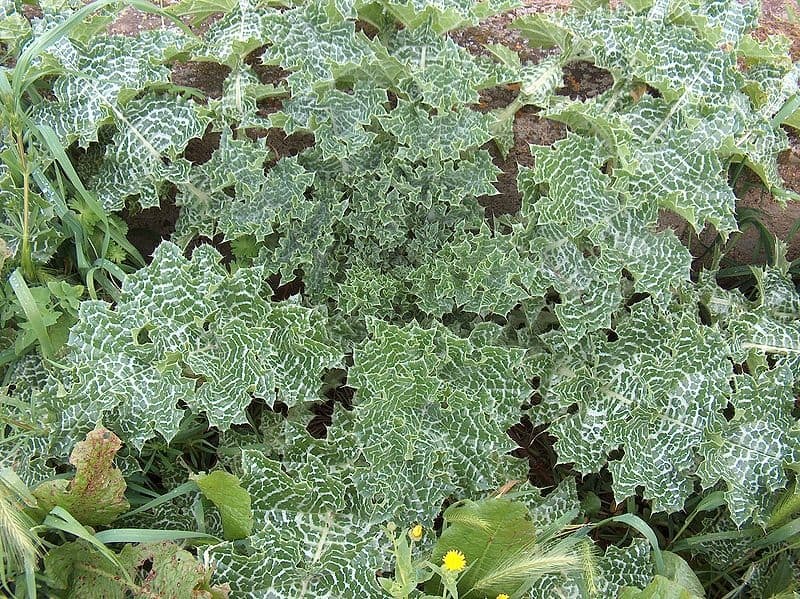 Milk thistle reaches a height of 4-10 feet, with spiny stems branching at the top. The leaves are wide with the white blotches and white along the leaf veins that give it this herb its name. The flowers are red-purple. The fruit is hard-skinned, brown, spotted, and shiny. Plant Parts Used: Commonly, the seeds; however throughout history virtually all the above-ground parts of the plants have been used as both food and medicine. In Germany the plant is often depicted as a religious symbol associated with the Virgin Mary; the species name “marianum” honors this symbolic association. According to popular legend, the milky white fluid that comes from the leaves when crushed is the milk of the Virgin Mary. 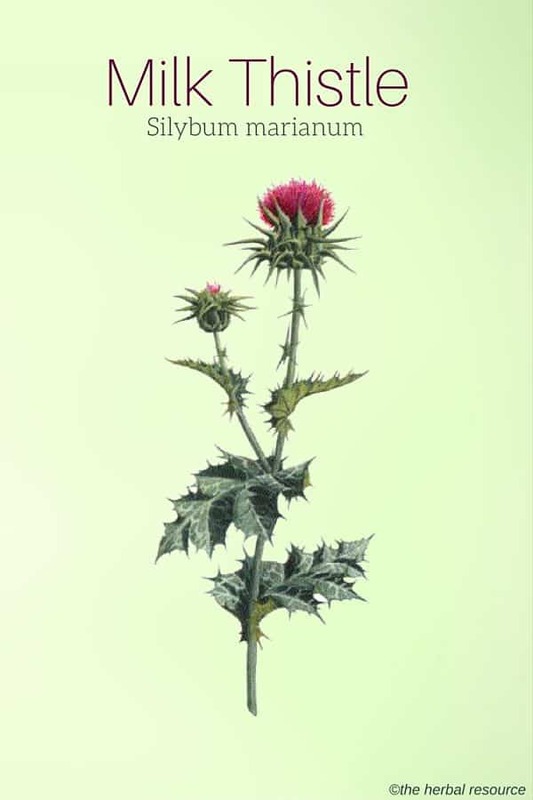 The active constituents of milk thistle are flavonoids (silybin, silydianin, and silychristin); essential oil; bitter principle; mucilage and its actions are cholagogues (release and secretion of bile from the gall bladder), galactagogue (help the breastfeeding mother to increase the flow of mother’s milk), and demulcent (soothe and protect irritated or inflamed internal tissue), antioxidant and anti-inflammatory. Since antiquity, milk thistle seeds have been used for the treatment of liver disease. Milk thistle is referred to in the earliest Greek writings as a liver-protecting herb. Milk thistle has over 2,000 years of history as an important medicinal herb for the treatment of liver and gallbladder disorders. At one time or another, all parts of the plant have been used both as food and medicine with few reports of toxicity aside from a mild laxative effect in some patients. Pliny the Elder (A.D. 23-79), the first-century Roman physician and naturalist, wrote about the use of milk thistle as a vegetable and considered it an excellent herb for liver related conditions. The benefits of milk thistle were discussed in a Medieval German manuscript published in 1533, The Physica of Hildegarde of Bingen. This was the first herbal originally written in 1150 by Hildegarde Bingen, a music composer, writer, and theologian who was a “renaissance woman” before the age of the Renaissance. She called the plant “vehedistel”, or Venus thistle, and documented the uses of the roots, whole plants and leaves of milk thistle. Culpepper’s herbal written in 1787 refers to milk thistle as an effective treatment to clear obstructions of the liver and spleen, and as a good remedy for jaundice. The eighteenth-century German physician Rademacher recommended the use of milk thistle for chronic liver diseases, acute hepatitis, and jaundice. Numerous well-designed clinical trials conducted in Europe, primarily in Germany, show therapeutic value of silymarin as a treatment for metabolic liver damage, chronic hepatitis, and bile duct inflammation, including conditions, brought about by alcohol, drugs (psychopharmaceuticals) and chronic liver disease. Studies demonstrate the ability of silymarin to protect the liver by accelerating the normalization of impaired liver function. Improvements in liver function include serum levels of GOT (glutamic-oxalacetic transaminase), GPT (glutamic-pyruvic transaminase) and GGT (gamma-glutamyl transpeptidase). Research shows that the active ingredients in the plant, silymarin and the active constituent silybin, work as antioxidants that scavenge free radicals and inhibit peroxidation. Several studies have shown that it may be beneficial in treating or preventing liver damage caused by alcohol, drugs or toxic chemicals. The active liver-protecting compound in milk thistle, silymarin, (a group of flavonoids; silibinin, silidianin, and silicristin), may help repair liver cells damaged by alcohol and other toxic substances. Silymarin also protects new liver cells from being destroyed by these toxic substances. An effective anti-inflammatory and a potent antioxidant, milk thistle may help protect the liver against toxicity from pharmaceutical drugs. In Europe, milk thistle may be given to patients when they are taking medications that have side effects that are known to cause liver problems. In a number of studies from Europe, milk thistle has been shown to be an effective herbal treatment for cirrhosis of the liver. Several preliminary studies of oral milk thistle for treatment of chronic hepatitis (liver inflammation) caused by virus or alcohol report improvements in liver tests. Use of milk thistle improved liver function and lowered the number of deaths in patients with cirrhosis of the liver. Milk thistle has been used as an emergency antidote for poisoning by Death cap mushroom (Amanita phalloides). Animal studies have found the milk thistle extract completely counteracts the toxic effects of the mushroom when given within 10 minutes of ingestion. If given within 24 hours of ingestion, it significantly reduces the risk of liver damage and death. 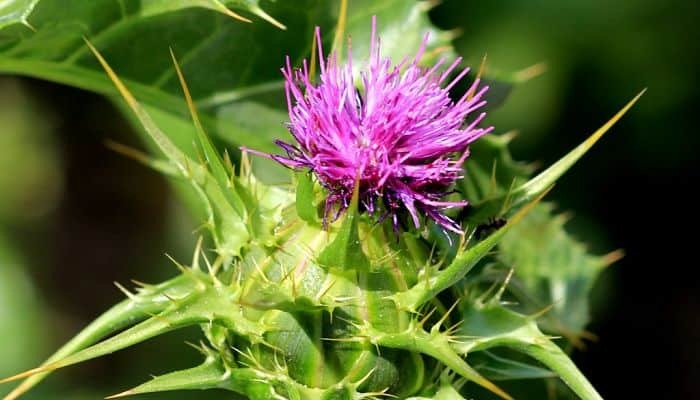 Preliminary studies from laboratory experiments report that the silymarin and silibinin in milk thistle may reduce the growth of human breast, cervical, and prostate cancer cells. Preliminary studies of the herb for treatment of diabetes suggest possible improvements of blood sugar control. Infusion: pour a cupful of boiling water over one teaspoon of the dried leaves and steep for 10-15 minutes. Drink three times a day. Overall milk thistle has a good safety record with rare case reports of gastrointestinal disturbances or allergic skin rashes. Those with allergies to plants in the aster family (Compositae, Asteraceae) or to daisies, artichokes, common thistle, kiwi or any of milk thistle’s constituents (silibinin, silychistin, silydianin, silymonin, siliandrin) may have allergic reactions to milk thistle. Antipsychotics – includes butyrophenones (such as haloperidol) and phenothiazines (such as chloropromazine, fluphenazine and promethazine). Phenytoin- a medication used for seizures. Halothane- a medication used during general anesthesia. Allergy drugs such as fexofenadine (Allegra). Drugs for high cholesterol such as lovastatin (Mevacor, Altocor). Anti-anxiety drugs including alprazolam (Xanax), diazepam (Valium), and lorazepam (Ativan). Antiplatelet and anticoagulant drugs (blood thinners) including clopidogrel (Plavix) and warfarin (Coumadin). I boil the roots of the thistle and drink the water every morning and immediately my asthma was over.. no more treatment. Thanks to thistle roots.